Carbonated soft drink sales have fallen for 11 straight years as consumers make healthier choices. But don’t write-off soda just yet -- innovative ingredients could lead to a bright future. Last year marked the eleventh consecutive year of declining carbonated soft drink sales in the United States, while soda consumption fell to a 30-year low. In June Philadelphia became the first major American city to pass a soda tax, while San Francisco and others will decide on parallel measures this year. 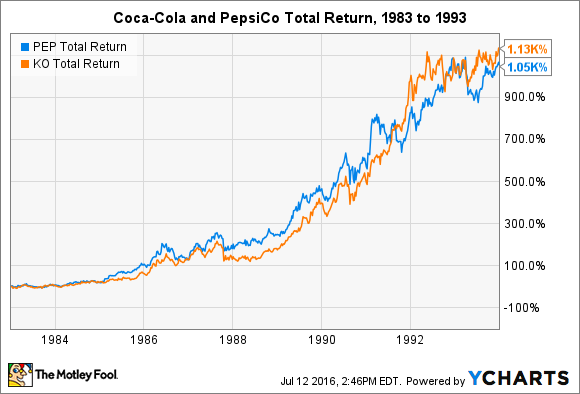 The downward pressure from these trends has put soft drink kings Coca-Cola (NYSE:KO) and PepsiCo (NASDAQ:PEP) in a difficult position in recent years, as each confronts slowing growth and, in some years, declining market share. Let's call a spade a spade here: sugary soft drinks have encountered difficult headwinds that may only intensify and may be permanent. But it's important for investors to take a more nuanced view of the situation. While sugary soft drinks may be dead, the soft drinks of the future may not contain any sugar at all -- and your taste buds won't even be able to tell the difference. Replacing sugar with innovative zero-calorie, plant-based stevia ingredients could have major implications for public health, the ability to avoid soda taxes, and investors. But Coca-Cola and PepsiCo face an uphill battle in convincing consumers that next-generation stevia sweeteners are not the same as previous artificial ingredients, or even past stevia sweeteners. It all started in 1951, when the U.S. Food and Drug Administration approved an artificial, zero-calorie sweetener called cyclamate. This gave birth to diet soda brands, but the ingredient's success came to an abrupt end after scientists found it caused bladder cancer in rats. It was banned in 1969. In other words, cyclamate lasted just long enough to prove that diet sodas had undeniable market traction, but left soft drink companies scrambling to find a new zero-calorie sugar alternative. However, cracks have emerged in the armor of aspartame in recent years, as consumers are increasingly worried about the ingredient's health effects (concerns that are unfounded). These developments led PepsiCo to remove aspartame from its diet soda in 2015, although it will be reintroduced this fall as part of a rebranding effort. Nevertheless, the simultaneous consumer backlash against artificial ingredients (aspartame) and sugar has increased the pressure on soft drink brands and sent a clear message: any zero-calorie sugar alternative needs to be "natural," or, at best, plant-based. While aspartame is a single compound, stevia plants produce a complex mixture of sweetener compounds called steviol glycosides. The first ingredients marketed as stevia sweeteners, Truvia and PureVia, are purified versions of a single steviol glycoside: Reb-A. The bad news is that it's accompanied by a bitter taste, doesn't do a great job mimicking sugar when used by itself, and can only be used to replace up to 30% of a soda's sugar content. The good news is that the industry has come a long way in understanding stevia sweeteners and their potential in new beverage formulations. For instance, Cargill's second-generation stevia sweetener, marketed as ViaTech, can replace up to 70% of the sugar in traditional soft drinks by relying on different steviol glycosides. The company's third-generation sweetener, to be marketed as EverSweet, can completely replace sugar without compromising on taste. While the FDA issued a GRAS No Objection Letter for EverSweet in June, Cargill and its partner Evolva have encountered setbacks in scaling production that have delayed its launch. Nonetheless, some have called it the "Holy Grail" of beverage sweeteners. Coca-Cola and PepsiCo have yet to announce formal plans to use EverSweet in new product formulations, but if they do, it may be challenging at first to communicate the advantages of next-generation stevia sweeteners over prior stevia sweeteners. After all, labels will still list something containing the word "stevia," which consumers may have already formed an opinion about. But investors may not want to bet against the marketing muscle of either company. The move to new stevia sweeteners is not without obstacles. Coca-Cola and PepsiCo have to clearly communicate how new stevia ingredients differ not only from past artificial sweeteners, but also from past stevia ingredients that had a reputation for being bitter and only able to be partial replacements for sugar. However, if consumers are demanding zero-calorie soft drinks, and the companies can deliver new formulations that don't compromise on taste, then stevia may very well provide a sweet future for the industry.